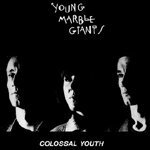 I remember buying Colossal Youth from a grotty indie record shop, empty on a cold, late Saturday afternoon aside from me and the owners, who were smoking, in their vests, behind a makeshift chipboard counter. It was situated in a grey, open-air, concrete claw that had been built as an example of the shopping experience of the future in '70s Britain (and was even a location for A Clockwork Orange) but now, in 1987, it smelled of piss and every other shop was boarded up. After an awkward shuffle to the counter I walked home, examining the shiny black cover: three Easter Island profiles, stoic and purposeful, looking upwards, forwards and backwards at the same time. I read all the song titles and imagined what they might sound like. I probably read the label, too. The band had split up years before, and although their debut had been a huge independent hit (and one of Rough Trade's biggest sellers) no-one I knew had even heard of them. It wasn't anything like I thought it would be, but then nothing that original, by its very nature, can be. The blunt clop, snap and hiss of a cheap drum machine; the clipped guitar, seizing up rhythmically or scratching around in the background; the play-in-a-day organ, sounding as if it was being rolled out over an empty, off-season pier; the vocalist, Alison Statton, singing to herself in a voice at once girlish and world weary. Not giving up, but not under any illusions. The secretary from The Wasteland fronting Wire, with blunt, disassociated vocals enclosed by tensed, sparing arrangements. I didn't turn on the light until the room was almost pitch black. There's something undeniably romantic about a band creating a masterpiece and then disappearing. The pleasure in excavating something, however small, about their existence from the media detritus; the shared enthusiasm and kinship when you meet a fellow convert; the sense of closeness to the music that you just don't get from your secret Van Halen obsession. Of course, this is built on things not working out right for the band in question, and splitting after one album isn't as romantic a notion if it's you contemplating the likelihood that you'll need to get a proper job. Despite their success at the time (and critical acclaim since), Young Marble Giants are still the finest band that no-one you know has even heard of, so here's your chance to not only redress the balance, but to hear one of the most perfectly realised debut records ever released.